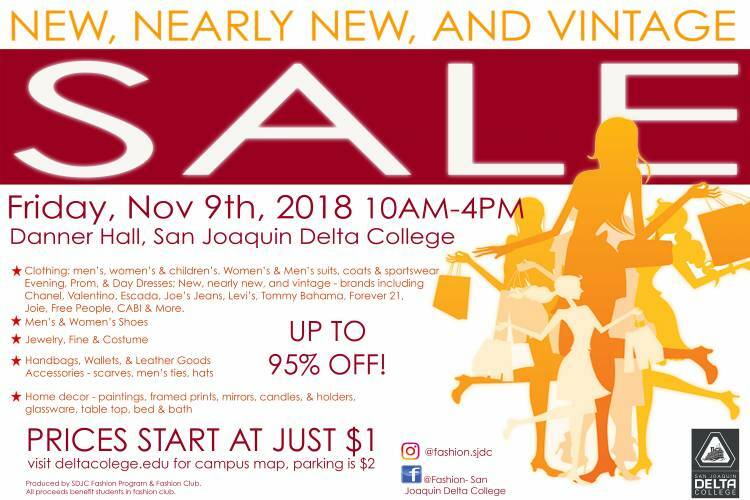 All proceeds benefit the students of San Joaquin Delta Colleges Fashion Program and go towards the students fashion show. Looking for amazing deals for a steal? Come shop at New and Nearly New sale! This is not your ordinary sale! Customers will be able to purchase brand-new, nearly new, and vintage apparel at unbelievably low prices starting off as low as $1! The inventory includes name brands and designer merchandise is mostly brand new with tags still attached and includes clothing for men, women and kids in all sizes, including prom & formal dresses, shoes, and accessories, such as: jewelry, scarves, wallets, handbags, belts, hats, fragrance, and skin care, as well as holiday decor, and home decor like wall art, frames, mirrors, books, candles, ornaments, lamps, table decor, and small furniture pieces. All proceeds benefit the students of San Joaquin Delta Colleges Fashion Program and go towards the students fashion show. The sale is free and open to the public. For maps and directions, visit:www.deltacollege.edu. Parking is $2 per day with ticket machines in all lots. The closest parking lot is S-1. You won’t want to miss this HUGE SALE! We hope to see you there!